Today I have the great pleasure of introducing you to a wonderful, sweet and caring artist who is not only extremely talented but also very supportive of, and encouraging to other artists. Who is, “BETTY”? Tell us a little about yourself. This is a hard question when you really stop to think about it. What defines me as a person is the tricky part…not the societal labels we are all too quick to use. I believe most people that know me well would say that I am an intense person, with a strong intellect, soft heart, and a person of stringent values and ideals. Getting to really “know” me I think would be difficult for many, because I tend to guard what I say and to whom I say it. That comes from too many years as a criminal investigator and always being the one asking the questions! I am extremely cautious in the close relationships I make with people, primarily because I have been hurt many times by people I trusted. But once a strong personal bond has been created, I consider those relationships for life. There is not much “gray” in my life. Things either “are” or they “aren’t” – black or white. While I have always had creative tendencies, with a love of color and self-expression, I tend to be fairly restrained and a little bit too orderly in my work. Writing was my first creative outlet. But I love making “art” and doing most anything where I can creatively express myself. My life has been extremely varied and complex, and I can draw on those experiences through my art. I lived and traveled all over the world before I was 30 years old, and these experiences have held me in good stead most of my adult life. How did creating art become such a large part of your life? Growing up, I was never allowed to take “fun” classes in school (art, home economics, etc), but instead was always forced to focus on academics and my “grooming” for a career. Creating “art” or crafts was a weekend pastime, usually with my Mother who was very creative. 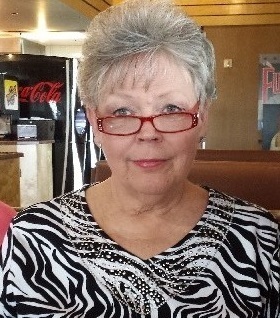 After I had a major cardiac event at work and subsequently retired when I was 50, I sought solace and activity in creative endeavors such as working with fused glass, sewing, crocheting, embroidery, redecorating my house, furniture…you name it. Something… anything I could do to occupy my mind and my hands. But that wasn’t enough. Then, one day, while trolling the internet, I stumbled across Tammy Garcia’s Daisy Yellow Facebook group. I was totally enthralled with the beautiful and such personal art I was seeing. Could I do that? The good Lord knew I had already amassed quite a collection of assorted art supplies…so I dove in head-first and asked questions later. I have never looked back. And I give Tammy 100% of the credit as a guide and mentor to my current obsession with journaling and creative art journaling. I learned so much from her brilliant mind and exceptional talent. I cannot thank her enough! Let’s talk art journals. 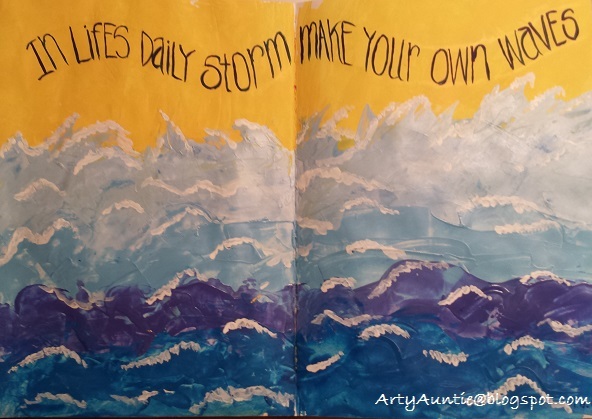 Why art journal? What goes in your art journal? Can anyone art journal? Let me take your questions one by one. I could espouse on this subject for a long time, but will try not to bore your readers! Heavy body acrylics applied with palette knife & credit card; lettering with bamboo brush and fluid acrylics. In my large Dylusions journal. WHY ART JOURNAL? 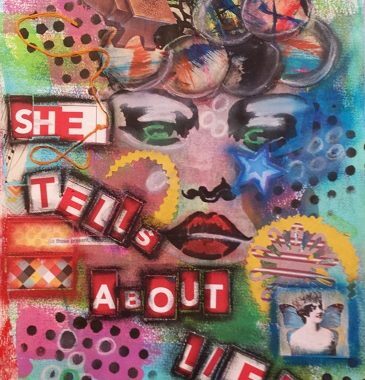 For me, art journaling is a way to express my moods, explore, experiment with “what-if’s”, create just for fun or “because” I feel the NEED to do it. 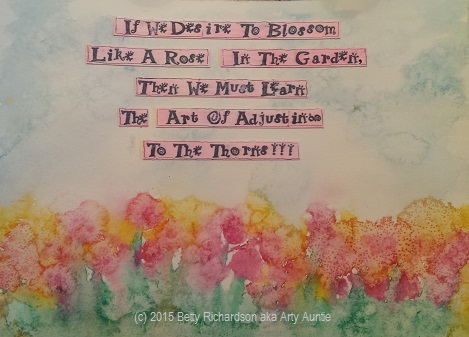 I use Art journaling in tandem and as an adjunct to my writing and journaling, where I let it all hang out. Then, after getting “out” all that inside stuff, I can express myself creatively in my art journals. I can help heal my spirit, my mind and my soul by visually expressing myself. Many, many of my art journal pages are never shared with anyone. Some are just too personal to share, you know? 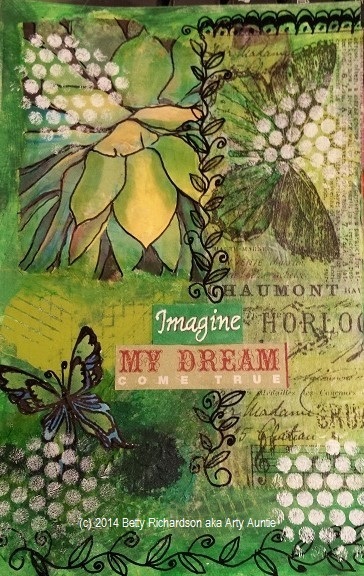 Your art journal is your own personal, private space…just for you. 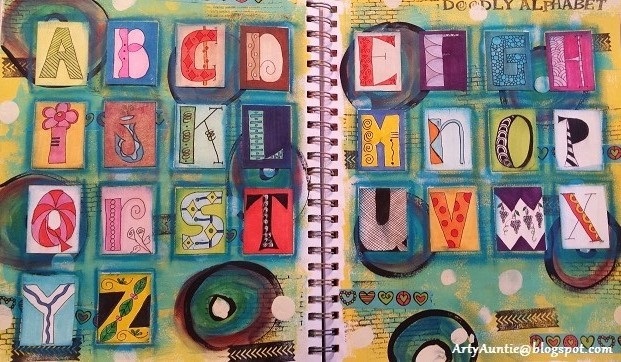 Art journaling can, and should be, a creative outlet for you to express yourself exponentially taking into account your being, your surroundings, your moods, your habits and your need to express these things in a creative way. For me, the act of art journaling is an outlet. A release. A necessity. I cannot imagine NOT doing it. Creative lettering turned into a journal spread in my 9×12” Canson mixed media journal. I drew all the letters first, colored most of them with Sakura Gelly pens and Copic markers, then did the background page with acrylics, NeoColor II’s, stamping and washi tape. WHAT GOES IN MY ART JOURNAL – well, part of this is answered above. But because I own and manage two art groups (one mail art, one art journaling), I do a lot of “prompts” geared just for the sake of creating and pushing our people outside their comfort zones, to explore mediums, techniques, ideas, and sometimes, we ask them to dig deep and explore their inner self. We developed prompts a year in advance for the journaling group, and it is a challenge sometimes to create art, on demand and in advance, but I push myself to do it. Thinking up the prompts is easy. Working on them “on demand” is difficult sometimes. I work in several journals at one time. From super large (10×16) to small pocket journals (4×5”-ish). The reason? Some days my muse is on vacation and “big” art projects just aren’t in me. I always have a pocket journal and a few gel pens in my purse and can whip out mandalas, doodles, zentangles or sketches while waiting somewhere like the doctor’s office, at the oil change place, over a relaxing cappuccino at Starbucks, or even while riding in the car. My journals have every kind of technique and art you can imagine in them. 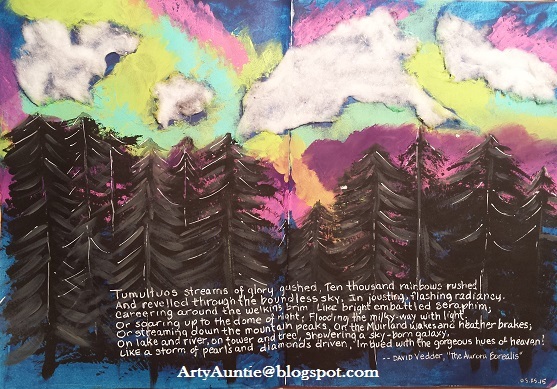 I belong to several art journaling groups, and will sometimes use “their” prompts in my own journals when I am “prompted out” with my own. Less brain activity required that way! I like the suggestive idea of prompts to kick start that “spark” of creativity, to get those creative juices flowing. And once started, the spread will lead me where it wants to go, at least most of the time, anyway! Mixed media in my large Dylusions journal. Prompt was “Northern Lights”. Clouds are white dryer lint. Dylusions acrylics that were scraped on with credit card and brushed; lettering with white Signo Uniball. CAN ANYONE ART JOURNAL? Absolutely, yes! No special skills or mediums are required. Do you doodle when you talk on the phone? Do you have some pens and pencils or even some crayons? Can you cut and paste? Do you have something to say about your day? Then YOU can art journal. No special artistic skills or drawing ability is required. I am a good example of THAT! I cannot draw, but I have a good eye for color. And I can cut and paste with the best of them. Tracing paper can be your best friend! You can do it! Salt resist watercolor, on 140 pound cold press paper, tipped into my Canson 9×12 mixed media journal. Stamped lettering, colored with Copic markers and outlined with Sakura Gelly pen in black. As a mixed media artist, what are your favorite art supplies to work with? If I was just starting in mixed media what supplies would you say would be my ‘must haves’? People ask me all the time what should I have to start art journaling. I started with a composition notebook, some Crayola brand colored pencils, two stamp pads and some watercolors. I made a ton of pages with no special supplies. I had scissors and a big load of magazines and some Elmer’s glue. Granted, when I look back at them now, they are rough. But I was being creative—in my own unique way and it made me happy. Very happy. It still makes me happy. I did a lot of trolling on Pinterest, and on YouTube. I watched a bazillion and one video tutorials of artists whose work I liked. What were they using? Did I have or could I get that? Could I dissect their work without having to watch a video? Yes. And I did. I asked lots of questions, and most everyone I asked was always willing to help guide me and point me down the path I was already taking. Art journalists love sharing. Ideas, mediums, materials, where to get it, how to get it, how to do it. I love, love, LOVE all my art journaling friends. And I thank them for being there, guiding, explaining, experimenting and sharing. We have all definitely bonded through this journey. 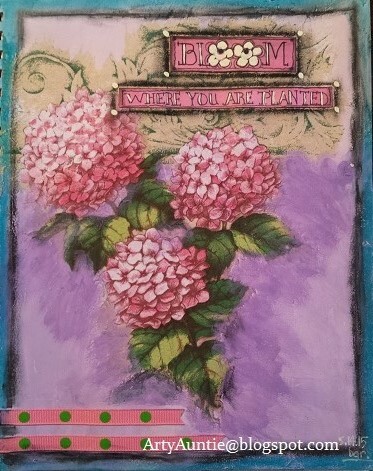 Mixed media in my Canson 9×12 mixed media journal. 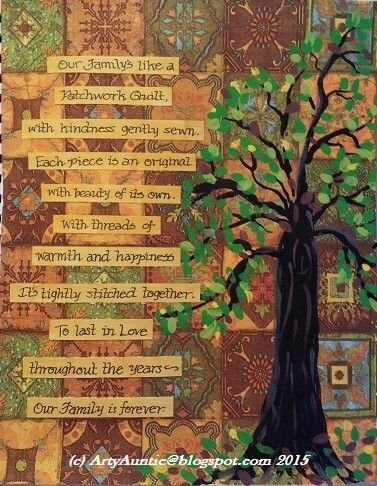 European paper napkin collage; hand painted tree with Dylusions acrylics; lettering on watercolor scraps colored with Copic markers and lettered with Black Sharpie fine tip marker. Journals are kind of a personal thing. Do you want unlined paper? Lined? Grids? I’m all about the paper. How it feels, how well does it take wet media, how is it to write on–with and without paint. For just journaling and writing, I want a fairly slick/smooth type paper since I journal with a real fountain pen or dip pens. I particularly like writing in Picadilly journals. I can tart up the covers, and pretty up the pages and edges easily. I rarely use paint in these journals, but will add washi tape and other decorative elements to the pages to foo-foo them up and break them up a little bit. I can usually fill two Picadilly journals a year just with writing. Writing is so cathartic for me. I MUST do it! I am also doing some faith-based journaling in a spiral notebook by Blue Sky called “Smart Notes.” It has a hard cover, really nice paper and lots of room to write and make study notes. I am in the process of doing a self-imposed Bible Study course and really studying the Bible. This is my third time to read the Bible cover to cover, but this time, I am really “studying” it. More writing. More healing. More awareness. Hopefully, more growth spiritually, and emotionally. Right now, I am in love with my Dylusions journals for “art journaling.” I have the large, the small, and as of last week, the new square black one. These journals can really take lots of wet media. They are super smooth, lie flat when working in them, and are a joy to work in. Mixed media in my Graphique pocket journal. As to other supplies: the world is your oyster. Things that are my favorites include: watercolor, colored pencils – any kind work, but I love the soft nature of Prismacolor pencils, but often use Crayola brand and other brands as well, Sakura gel pens, my trusty bold Signo Uniball 207 pens in black and white, craft and heavy body acrylic paints and Dylusions alcohol ink sprays. I love using stencils and every kind of ephemera (bits and bobs) known to man. Of course I use everything I can play with, get my hands on and can afford to buy. I am only limited by my budget. Definitely not my imagination. You run a Facebook group called Artful Mail Groupies. 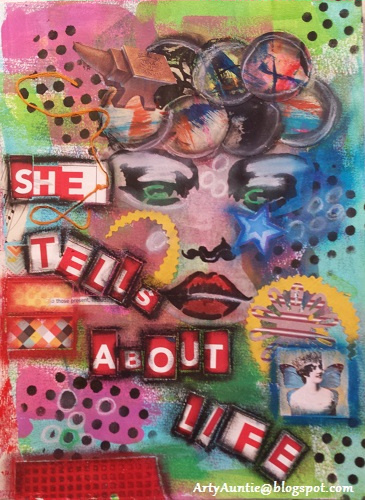 What is “artful mail” or mail art? 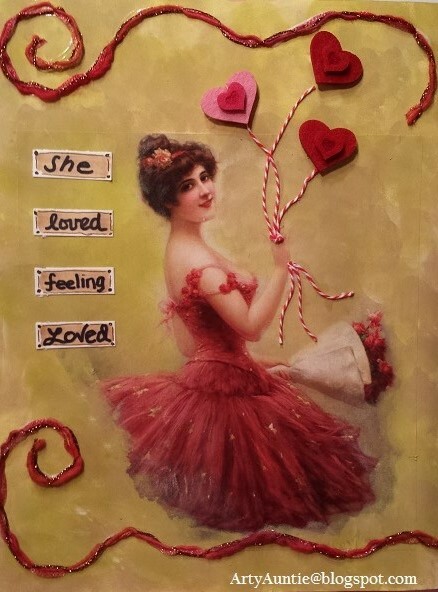 Mail art exchanges are just that – you create “art” in a specific form and exchange with another member of the group who also signed up to participate in a specific type swap. When I started AMG about 18 months ago, I wanted to trade “art” with other people. Other groups were doing it, but no other mail art group I was in really felt comfortable to me, so I decided to create my own. My idea was to have a group that was personable. You get to know us, we get to know you. We treat you like family and love you the same way. We do everything at AMG. We make and exchange ATC’s (artist trading cards), postcards, rolodex cards, altered art (anything and everything you can alter), tags and the oh-so-fun Happy Mail! If you can dream it up, we can do it. We (me and the admin team) set up the swaps and interested persons in the group sign up, then partners are assigned and each participant creates their swap according to the specific swap guidelines and mails (hopefully) by the specified due date to their assigned partner(s). Happy mail is just that – mail to make someone happy. We basically share our “stuff” for their “stuff” and this can encompass everything from bits of ribbon and lace to painted papers, bits and bobs and ephemera of every description. We often have themed Happy Mail swaps. It might be a little, or it could be a lot. Happy mail is a lot like opening presents on Christmas Day. You never know what you are going to get. One woman’s “extras” are another’s very special treasures. 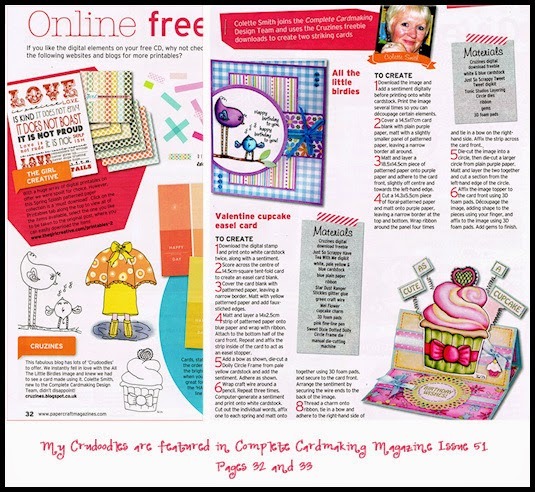 All of which can be used in creating mail art or on your journal pages. Altered Book/journal cover that was for a swap in Artful Mail Groupies. Dylusions Acrylic over gesso, stamping and collage. The inside was all tarted up as part of our exchange, but I loved how the cover came out. Left it rather simple so that repeated handling would not deter my partner from using it. 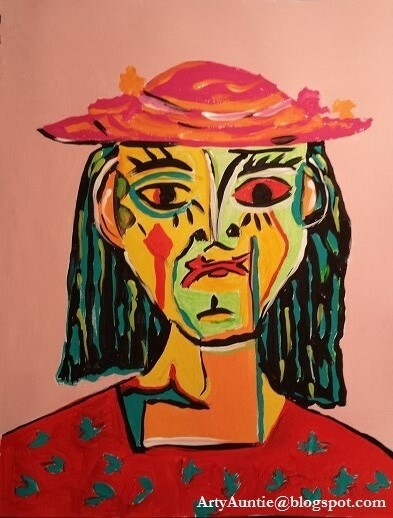 Out of all the art that you have created, is there any one piece which is your favorite? If so, why? I have a few that I like more than others, and some I don’t like at all. But picking just one … that’s difficult. Some I like because they just resonate with me. Others I like because of the technique, and still others I like because of the materials or overall composition. The ones I don’t like others may love and I am always appreciative of their positive comments. I am my own worst critic. Picking just one favorite…can’t do it! Acrylic in my Canson 9×12 mixed media journal in response to a prompt to create something that was “Picasso” inspired. This was mine. Recently you planned and hosted your first art retreat! How exciting! Can you tell us a little bit about the art retreat. Will there be another one? Oh my, was this ever fun and it was a great success. All the attendees seemed to have a great time and we enjoyed each other’s company immensely. In an effort to make the retreat affordable to everyone in our groups, I tried to keep the costs down by doing everything myself. Attendees paid $115 that included 4 nights lodging, all their meals, the off-site workshop and all their supplies during the retreat. I had made arrangements for us to stay at a huge 4200 sf residence on the other side of the lake (I live on a beautiful lake about 55 miles east of Dallas), but sadly, the property owner long leased it out from under me. I couldn’t find anything anywhere close to similar in size and adding the cost of a hotel was NOT in the budget, so I ended up hosting at our vacation rental property, which was about half the size. It’s a cute cabin, right on the water. The weather was perfect the first two days, rain for the next two, but we didn’t mind. We were all busy arting! Mixed media in my 9×12” Canson mixed media journal. This is the type of page that is hardest for me. I can add paint until the cows come home, but just adding more bits and more paper (JAM = just add more) is the hardest for me. While cleaning off my worktable one night after making the background page, I just started gluing down random bits of paper and assorted trash and ephemera that was laying on the table. For whatever reason, it actually works and I was happy with it. Used acrylics, stencils, NeoColor II, black china marker, white Signo Uniball pen, threads, found poetry (letters that were just random and laying on the table—I made up the quote), punch cut circles, leftover bits of painted papers and images, cut outs from using decorative scissors, a face image that was printed on deli paper, scraps of scrapbooking paper, a piece of newspaper. JAM. Isn’t it fun? We had 10 participants, and I completely emptied out and carted all my art supplies and equipment (6 car loads) to the cabin for everyone to use so they wouldn’t have to bring so much with them. (I won’t do THAT (all the art supplies) again, for sure, and the hubs said he wouldn’t help with that bit again, either! Ha). We attended the world famous Canton (Texas) Trade Days flea market on Thursday, stayed in and arted all day on Friday (it was pouring rain all day anyway, but we didn’t care), went to a workshop at Big Mouth Scrappers in Forney, Texas on Saturday and made the cutest Texas-themed journal, designed by Angela Medina (designer for Tim Holtz). Tiffany Goff Smith came all the way from Alabama and taught us a new way to make mail art envelopes to get us to “think outside the box”. 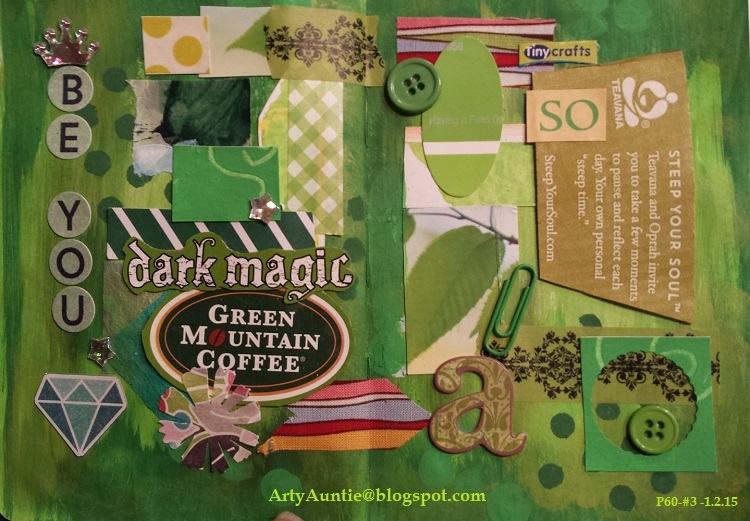 We did a journal collaboration project and an altered cigar box project, in addition to more basic art journal pages. We had attendees from California, Arizona, Illinois, Alabama and Texas. We had some very generous donors for our goody bags including Golden Arts, Retro Café Art, UmWow Studios, and iStencils. One of the ladies printed up a bunch of her Teesha Moore style art and gave out to all the attendees for use in their own art. It was a fabulous time and most definitely we will do it again. Early fall in Texas almost always has perfect, predictable weather, and it sure beats the summer heat in the triple digits! Tall, graying, fluffy, talkative, intelligent, generous, loving, creative, assertive, honest. Thank you so much Betty, for this wonderful look into your creative process, your art and you. 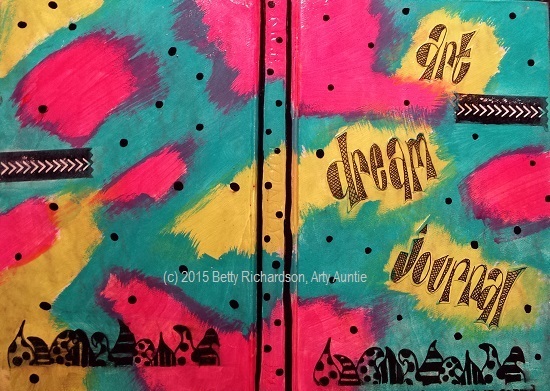 Posted in artist feature, artist interview, Friday Art Feature, mixed media and tagged art journal, artist, Betty Guffey Richardson, journaling, painting. Fun interview, Betty! Thank you for the shout-out!! !